By far the rarest of the great early maps of Hawaii. Perhaps the rarest of all the great early maps of the Hawaiian Islands, this is the Russian language first edition of Admiral Adam Johann von Krusenstern's important map of the Sandwich Islands or Hawaii. The map covers the Hawaiian archipelago in full with an inset of Honolulu harbor in the lower left quadrant. The map includes some topography, rendered in hachure, as well as limited depth soundings. The inset of Honolulu Harbor offers greater detail with countless depth soundings as well as an alphabetic key identifying important buildings and fortifications. The Imperial Russian Admiral Adam Johann von Krusenstern visited Hawaii in 1804, contemporaneously with fellow Russian Urey Lisiansky. Krusenstern's mission, as laid down by Tzar Alexander I, was to establish communication and trade between Russia, China, and Japan via Cape Horn and the Cape of Good Hope. They sailed from the Baltic port of Kronstadt westward, around Cape Horn, into the Pacific, visiting China, Japan, Hawaii, and the north Pacific, before turning south to round Africa and return to Kronstadt. It was the first Russian circumnavigation of the globe. Krusenstern published an atlas of the Pacific in 1827, earning him an honorary membership in the Russian Academy of the Sciences. This map is from that Atlas. Unlike Cook and Vancouver, Krusenstern in fact spent very little time in Hawaii - he apparently found the prices being charged for provisions in Hawaii prohibitively high - and so this chart offers little in the way of unique survey work. This chart's significance lies in Krusenstern's careful and educated amalgam of various earlier Hawaii charts into a single superior chart. evidence suggests Krusenstern's chart references the work of Vancouver, Cook, Malden, Kotzebue, and Baker - among others. This is this the first major map of Hawaii that synthesized all of cartographic work of the previous three decades into a single more advanced map. 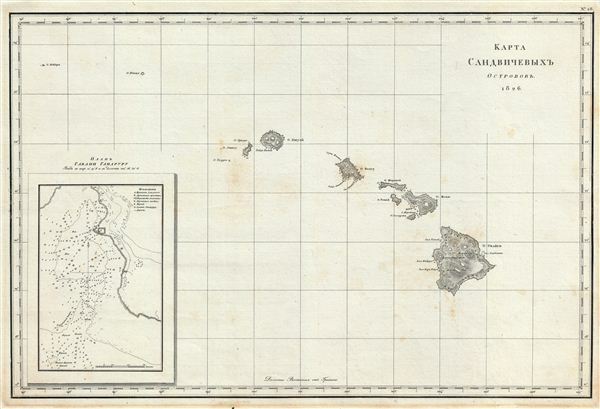 Krusenstern's map of Hawaii was considered so significant that a later updated edition, published in 1835 and currently in the archives of the Library of Congress, was used by Captain Charles Wilkes to plan the 1838 - 1842 U.S. exploring expedition to the Pacific. It is difficult to fully express the extreme rarity of this map. The Russian first edition of this map has for all intent and purposes never before been on the market. The subsequent French edition housed at the Library of Congress is itself so rare that no further original examples of the original work have been identified. For a serious Hawaii collector, this is a once in lifetime opportunity. Adam Johann Ritter von Krusenstern (November 19, 1770 – August 24, 1846), was an admiral and explorer, who led the first Russian circumnavigation of the globe. Krusenstern, A. J., Atlas k puteshestviuu vokrug sveta kapitana Kruzenshtema, (St. Petersburg) 1827. Very good condition. Very minor foxing. Fitzpatrick, G. L., The Early Mapping of Hawai'i, pp. 137-140.